Kabam, a U.S. maker of free-to-play mobile games, is going through what could be its biggest transformation to date. The San Francisco-based company, known for Hollywood tie-in games, is launching its own game in China for the first time, while restructuring its business model to compete against the industry’s most powerful players like Finland’s Supercell. Founded in 2006, Kabam has become a major developer and publisher of smartphone games. But its $400 million revenue last year missed its own forecast. Meanwhile, the industry landscape is changing rapidly as one hit wonders become less common and a handful of leading players spend more money on development as well as marketing to cement their positions. Kabam is scrambling to stay in that leading pack. Last week, Kabam said it would launch its popular game, “Marvel Contest of Champions,” in China later this year, taking advantage of its alliance last summer with Chinese e-commerce giant Alibaba Group Holding, which invested $120 million in the U.S. company. While pushing its own games, Kabam has decided to move away from its other business of publishing titles supplied by third-party game developers, as part of its efforts to concentrate its resources on fewer games. 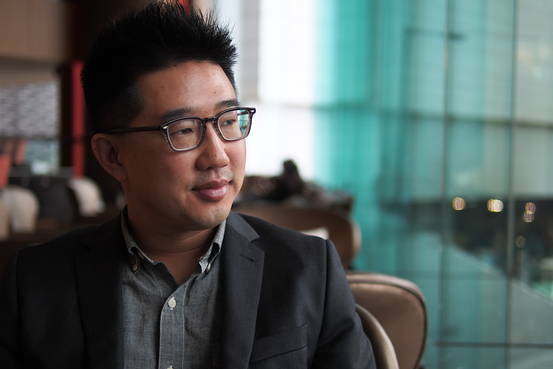 In an interview in Hong Kong, co-founder and chief executive Kevin Chou discussed how Kabam is trying to stay competitive in the fast-changing industry. WSJ: How is your partnership with Alibaba going so far? Chou: The reason why we went with Alibaba was because we decided that we wanted to get very serious about China. We’ve had an office in Beijing for five years but we actually have never released our products in China. Now we are finally announcing “Marvel Contest of Champions,” our very first product that we are going to fully localize for the Chinese market. Alibaba–which distributes games through its own apps and also owns app store operator UCWeb–will definitely be one of the platforms for this game. Alibaba is giving us a lot of advice as we negotiate our deals with other Chinese companies. In China, there’s credibility that comes with us working with Alibaba. We have also been working with Alibaba on technology infrastructure, as Alibaba runs a big cloud-computing business in China. WSJ: What are the biggest changes you see in the mobile games market? Chou: In the mobile gaming industry, you are starting to see the same companies make successful products over and over again. There’s only a handful of companies that can do that. Budgets for developing mobile games are getting higher, and the industry is spending more money on marketing. During Super Bowl this year, there were three mobile game commercials – Supercell’s “Clash of Clans,” Machine Zone’s “Game of War” and UCool’s “Heroes Charge.” There wasn’t a single console game ad. I think you will see marketing budgets continue to increase. And we want to make sure that we are very competitive in that world. You will see us put together very significant TV and outdoor marketing campaigns this year. The companies with the right capital and right infrastructure will continue to pull away from the rest of the industry. I think that’s healthy. Wall Street doesn’t want to see an industry that is always changing. Investors want to see solid leadership. I don’t think the market would value an industry where it’s very easy for anybody to come in and make a huge hit, because there would be too much uncertainty. WSJ: Why do you think Supercell is so successful? Chou: Finland has a very incredible talent base. I think it’s a combination of Nokia and a lot of traditional gaming companies that have set up studios there. There is a long history of talent development out there. I have a lot of respect for Supercell. They make good products. Their marketing execution is phenomenal. They put all those things together really well. WSJ: In late 2014 you decided to stop investing in the business of publishing third-party games to concentrate on your own games. Why did you make that decision? Chou: It was a very tough decision. But we have to be more focused on games that have a shot to be the biggest hits. I want all of my top leadership focused on that biggest opportunity. We started the third-party game publishing business about two years ago. But even in the past two years the market has changed very rapidly. The No. 1 mobile game in the world now makes about $150 million a month in revenue. In 2012, the No. 1 game was our game, “The Kingdoms of Camelot,” and it made $5 million a month. Revenue and profit are getting more concentrated at the top. And the companies behind the biggest hits today focus on their own games. Our third-party game business is profitable, but it’s not possible to launch the world’s No. 1 game through this business model. It’s very clear that, a year or two from now, the No. 1 game in the market is going to be so big that wasting time on smaller games won’t make sense. WSJ: What are your fundraising plans now? Are you planning an IPO? Chou: We raised $120 million last year, and we have over $150 million in the bank today. Last year our revenue was $400 million and we are profitable. So we probably don’t need to do another round of financing. The next financing will probably be a going-public event. But we are not actively pursuing an IPO right now, because the stock market conditions are not ideal. We are certainly not going to go public this year. I think what we need to see is a public company becoming one of the top players in the mobile games market. Gradually, as the industry solidifies and the same companies make top-grossing games over and over again, Wall street will start giving higher multiples to mobile games companies because there will be more certainty that those companies will continue to make top successful games. WSJ: What’s your view on Nintendo’s decision to team up with mobile game maker DeNA? Chou: I look at Nintendo entering the mobile gaming business as finally a recognition from even the most stubborn companies that mobile is going to be so big that it can’t be ignored. These days the top grossing mobile games can be bigger than movies. Nintendo has incredible franchises, incredible intellectual property and characters that are loved by hundreds of millions of people. If they managed it correctly, I think Nintendo can make both mobile and console games successful. Marvel, for example, has very large movie franchises but also successful TV series as well. Do people who watch the TV series also go see Marvel movies? Of course they do. In fact, somebody watching the TV show may be more likely to pay for the movie.